DomainWink Review 2019: Is DomainWink a Good Hosting? Founded in 2008, DomainWink offers website hosting services, VPS, Reseller, and domain registration services. It’s based in the Philippines, but its data center is in Los Angeles, U.S., making it a relevant vendor not only for those in its base country, but the United States as well. All plans are managed using cPanel, which is relatively easy to use. Added to that is a one-click script installer for fast deployment of web applications like phpBB, WordPress, Magento, and Joomla!. There’s no website builder. I like the support for e-commerce businesses. Aside from the free SSL certificates offered, there are also more security options like open PGP/GPG for encryption on messages and files and support for merchant accounts and PayPal. With those, you might not need to deploy an e-commerce platform like Prestashop or Woocommerce. Instead, you can simply use the Paypal buy button, especially if you run a simple store. Another plus is the use of CloudLinux and RAID protection in the shared servers for increased security and individual use of resources. DomainWink has three shared hosting plans going from 1GB storage and 10GB bandwidth to 20GB storage space and unmetered bandwidth, and they are all low-priced. This is surprising given the premium features that come with them such as CloudLinux, e-commerce support, RAID protection, and free SSL certificates. 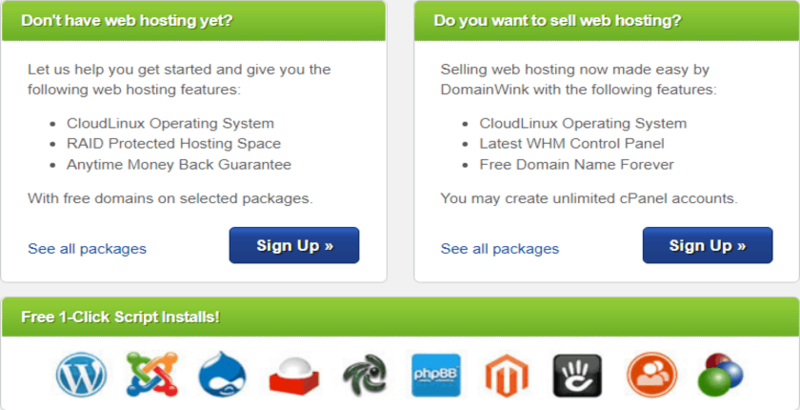 To add to those, DomainWink offers a free lifetime domain registration, which is hard to find in the industry. Another uncommon thing is the anytime money-back guarantee. This means that regardless of when you wish to opt out, you don’t lose your leftover money for the duration of the contract that you haven’t used. Its VPS is low-priced as well, with the starter plan offered at the same cost as most shared hosting plans, yet offering more resources. You can contact DomainWink customer support using its contact form, phone number, support ticket, and live chat. There is a knowledge base with a few articles, as well. Overall, DomainWink is a solid choice. It offers resources that make hosting for e-commerce businesses simpler, and the performance and security of its servers are maintained on a high level. Wondering how DomainWink stacks up against other Web Hosting companies? Enter any other Web Hosting company and we will give you a side-by-side comparison.